The John M. Sweeney trophy is presented annually to the champion of the Times Football League at each convention, who gets possession for one year to display it proudly. Though its official name comes from the first owner to win the league championship, owners have always called it by its unofficial name, the T. Rex. 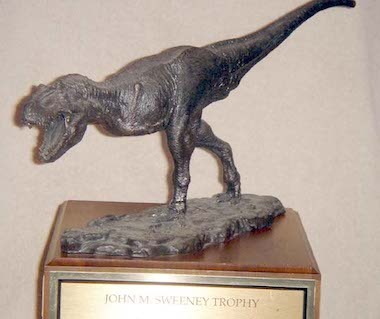 "Similarly, the league's championship trophy, the T. Rex, is a tribute to Sweeney's physical form -- most notably an ample midsection framed by comparatively tiny arms. These arms took on a reptilian quality during his furious three-finger pecking frenzies on the computer keyboard. Sweeney didn't tap the keys. He pounded them. Sweeney on deadline was not unlike a tyrannosaurus rex at suppertime." To date, there have been two John M. Sweeney trophies, both with their own set of controversies. In 1994 it was becoming obvious that the TFL wasn't just another fantasy football league. 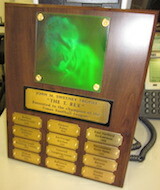 The league needed a trophy to honor its champion and the first attempt, a plaque actually, was commissioned and built featuring a hologram T. Rex as its centerpiece. Look at it from the left, you see a green dinosaur roaring at you. Look at it from the right, the dinosaur becomes a skeleton. The artist of the hologram is unknown and you can still find it for sale online. The plaque was constructed by Nor Mar Engravers in Novato, Calif. and first presented to Taylor after the Pyles won the 1994 Sweeney Bowl. It is unknown who was the last owner to be presented the Hologram version. Historians claim they are certain it was no longer used starting the 1997 season. What brought about its demise? One rumor says it was a spelling mistake, but modern historians dispute that. Lore says that despite room for three more teams to be added, TFL founder Ken Sain retired the first John M. Sweeney trophy without any discussion because it came back from the engravers with the name of the 1998 champion as the "East Hartford Ex-Eshimos." Sain was livid at the error, and the neglected trophy would sit that way for more than a decade while the new trophy made its rounds. Many in the league forgot that it ever existed. Eventually, Sain brought the TFL's first trophy into Dottie's Trophy Shop in Laurel, Md. and had them add the missing champions, in addition to making other repairs. The most obvious was correcting the spelling of "Ex-Eskimos." It took nearly two decades, but the first trophy was finally completed. While that's an amusing story that Sain likes to tell, historians challenge the spelling mistake as causing the demise of the Hologram trophy. They point to a photo of the league's owners taken at the 1998 Boston convention, before Chris Reidy won his first Sweeney Bowl. Steve Katz, the 1997 champion, is clearly holding the second John M. Sweeney Trophy, nicknamed the Dino. When pressed to explain this, Sain changes the subject. It's unclear when the second T. Rex started to be used. The first photo of it is shown in that 1998 photo. Sain had it constructed while living in Kentucky, so it had to be sometime between the summer of 1996 and the start of the 1998 convention in Boston. Keeping with the tradition of the first trophy, the names of winning teams are etched on the sides of the T. Rex base, which supports a resin statue of a T. Rex charging toward its prey. The T. Rex sculpture was done by San Francisco-based artist Tony McVey. It was assembled by Trophy Awards, Inc. in Covington, Ky.
Before the Buffalo convention in 2003 the trophy ran out of room for new teams to be added. All of the owners attending that convention took it into a Buffalo trophy shop and had them enlarge the trophy, creating room for 12 more teams. The current version of the T. Rex is due to run out of room for new champions after the 2017 season. The league tried to ship the trophy from winning owner to winning owner, but that came to a stop after Anchorage Kitchen owner Nate Sagan returned the trophy to Sain in pieces. "That's the way it arrived!" Sagan proclaimed. 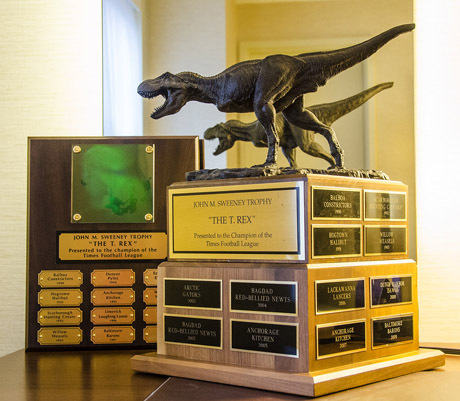 Sain purchased a second trophy from the artist and took the damaged T. Rex into the Covington trophy shop. To his surprise, they were able to glue the original back together. Still, Sain decided to put the newer trophy that hadn't been shattered on top. He kept the second for himself and locked it away in a vault, vowing never to gaze upon it until he wins its brother. The pair have not been reunited as of 2014. The nice, new and freshly rebuilt T. Rex lasted all of one year before its tail was snapped off. That piece is long gone and the mighty dinosaur bears the scar of that injury today. The T. Rex was damaged further when Sain tried to lift it out of a shipping box, snapping it off at the ankles. Glue helped repair that damage. The league has discussed replacing the paper-thin resin version with something more sturdy, able to stand up to time and the abuses league owners put it through, but that has become controversial. In the summer of 2014 it is still unclear if the league will invest in a brass dinosaur, or if it will wait until its current trophy must be shipped around in pieces inside a shoe box.